Back in October 2005, I posted about a Fresh Distraction - a new kitten in our house. The post ahead will be brief, but it will be a sad one. I feel it's only fitting that I write something about our cat, Amara, since I did introduce her on my blog all those years ago. This past April, we found out that she had a tumor in one of her eyes (she'd always had some runny eye issues that the vet was never able to clear up). It was a difficult decision, but we decided it was for the best that we put her to sleep, especially since there was no way of knowing if the tumor had spread or not. We gave her a few more months though, so she could enjoy some open windows, but we knew it was time when she was no where near as active as she used to be, and in June we said good-bye. She wasn't my favorite cat (maybe because she was such a naughty kitty - lol), but she was still much loved. Below is a list of a few things about her. - Her name means unfading. Some of her nicknames were Fuzzle (or Fuluffle) Rat, Fluff Head, Fur For Brains, Dumb Cat (lovingly, honest! ), and Kitty Girl. - She was the naughtiest cat I've ever owned. She is the only cat I've owned that I've put a collar on because we needed a bell on her to know where she was if she was being naughty! - When she'd try to sneak into the basement, she'd give herself away by meowing every step (and it was a special, she knew she was being naughty, meow). - Cords? Chewed them, and not only as a kitten (she's the reason I switched to a cordless mouse). - Fake Yule tree? Uh-huh, chewed that too. Yes, I said fake. - Balloon ribbons, feathers, rag to clean eye glasses with, other various things that I can't think of right now - chewed those too! - When we would pet her, she would drool, profusely (yes, this cat seriously had an oral fixation). - Box cat! Oh, look, it's a box, I must knock it over, I must see what's inside. - She would chase Roland (my poor, Kitty Boy) around the house and she was so mean to him. She was his arch-nemesis. - She was also a selfish kitty. She expected Roland to groom her, but she never returned the favor. - When she'd stretch out on a rug, we'd call her Rug On A Rug. She also had huge paws. - She liked to chase bugs and eagerly watched the birds outside, but when we had a mouse in our house, she didn't much care. - She was also the Chicken (or Poultry) Fiend. Anytime we had chicken, she'd be begging us for some. And many a time she'd knock over the garbage to dig out the chicken bones in it. - She would rotate her preferred sleeping areas. And one of those spots was a shoebox (I did say she was a box cat). Near the end, she rotated through some of her favorite spots daily, when usually she'd stick to spots weeks at a time. - See that picture off to the right? 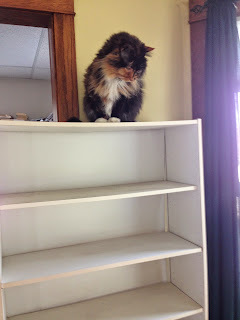 That is our Fuzzle Rat, Dumb Cat on top of a bookshelf only a couple weeks before we took her in to be put to sleep. She was a great jumper. And no, she didn't know how to get down. I had to rescue her. See, there is a reason we called her Dumb Cat! OK, I think that's all I can manage for now. I tear up easily. All of my animals become part of the family, and it's hard to lose them. NEXT UP: What Am I Writing? Yup, I was supposed to write about Midsummer, which happened on June 21 this year. At this point, I'm going to save that post for next year. June was a crazy month, with the first week being the craziest. My husband was out of town for work the whole week, so that left me alone with both of the kids. Talk about a way to wear anyone down! The 14th we had to take one of our cats in to be put to sleep (eye tumor). And the week immediately after the 21st (which is when I planned to write up the post), we spent the whole week getting the house straightened due to a cookout we had on the 28th. I hate cleaning. Hate. Needless to say, I didn't get much writing done either. I tried to write on June 1st, Day 1 of "Home Alone With Two Crazy Kids", and I was so exhausted I was making such silly mistakes. Definitely a facepalm moment. But June is over. It's July now. Yay! A new month is always good. Especially a new month where I have already made great writing progress. I'm back to revising Dead As Dreams, and I did another edit of Chapters 1-6 already (see my shiny progress bar to the left - progress!). I will now be in never-revised-before territory. Eep. I just hope I can make it as good as I want to. I love the world so much. Actually, I love my two main characters so much. 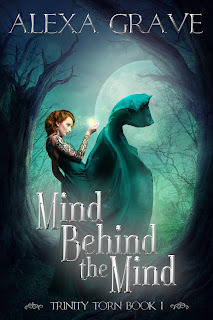 The next time I post a snippet of what I'm writing, I promise it'll be from that novel. Keeping this post short, though. Next post will be a sad one, but I feel obligated to do a small In Memoriam for our kitty who is now gone, especially since I have a post oh so many years back from when we first got her. For now, I wish you all happy reading and writing!